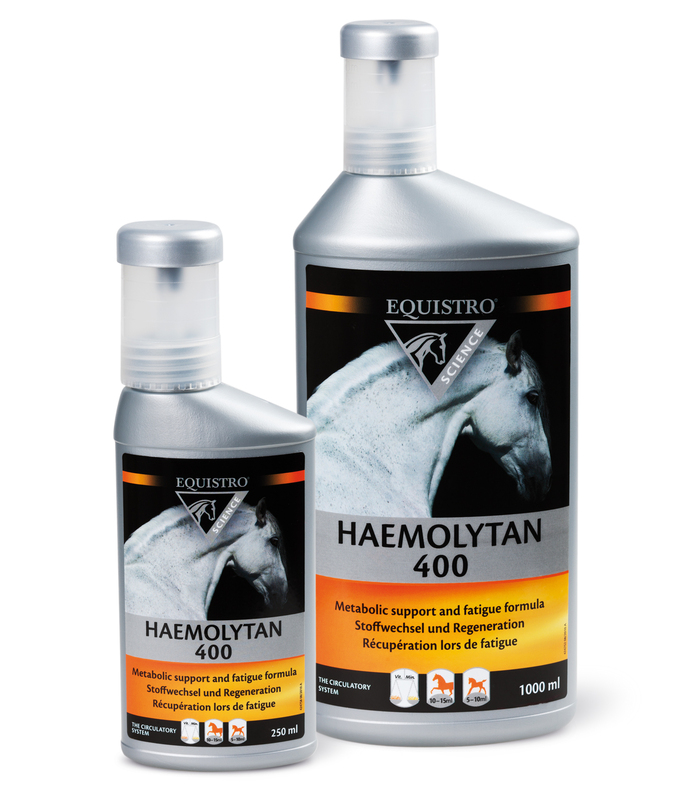 Haemolytan 400 is a dietetic complementary feeding stuff for horses enriched with vitamins and readily assimilated trace elements, copper and zinc (IPALIGO®). Haemolytan 400 helps provide the elements necessary for red blood cell synthesis as well as for recovery after periods of intensive effort or during critical periods (e.g. convalescence, foaling, gestation etc.). Haemolytan 400 is a dietetic complementary feed. COMPOSITION: Sugar syrup, glycerine. ADDITIVES/KG: Compounds of trace elements: Zinc (as Zinc chloride, monohydrate) (E6) 3970 mg, Iron (as Ferrous sulphate, heptahydrate) (E1) 3490 mg, Copper (as Cupric chloride, dihydrate) (E4) 198 mg, Cobalt as Cobalt acetate (II), tetrahydrate (3b301) 12 mg. Vitamins and pro-vitamins: Vitamin B1 (as Thiamine hydrochloride) 1190 mg, Vitamin B6 (Pyridoxine hydrochloride - 3a831) 801 mg, Niacinamide (3a315) 794 mg, Calcium-D-Pantothenate (3a841) 793 mg, Vitamin B2 (Riboflavin) 792 mg, Folic acid (3a316) 397 mg, Vitamin K3 198 mg, Vitamin B12 12 mg. Aromatic substances: Glycine 9799 mg. ANALYTICAL CONSTITUENTS: Moisture 48%, Crude Protein 2.5%, Crude ash 1.72%, Crude fat 0.8 %, Crude fibres 0.3 %, Sodium 0.2%. • Horses (500 kg): 10 to 15 ml per day, or 20 ml 2 to 3 times per week. • Light horses, ponies and foals: 5 to 10 ml per day, or 15 ml 2 to 3 times per week. Administer for 3 weeks during intense sporting activity. To be added to the feed/water or given directly by oral syringe. For nutritional restoration in convalescing horses, HAEMOLYTAN 400 should be administered until full recovery. N.B. It is recommended that a specialist‘s opinion be sought before use or before extending the period of use. Due to presence of trace elements with maximum set limits, administration must not exceed 120 ml/ 500 kg horse/ day.